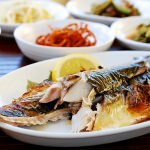 Traveling through Spain, a couple of months ago, my daughter and I fell in love with the abundance of seafood, especially octopus, squid (calamari), and cuttlefish! So many different varieties and sizes! We ate seafood at almost every meal. 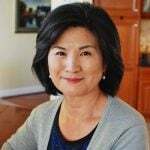 While we were enjoying grilled whole small squids, sitting on the curb side of a narrow street in Madrid, I thought of trying this Korean spicy grilled squid dish with small squids instead of the typical larger squids. 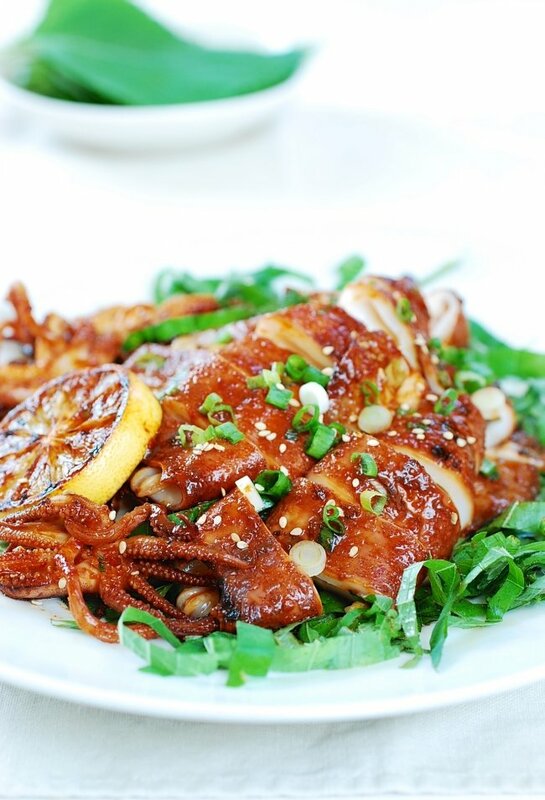 Cooked in many different ways, squid (ojingeo, 오징어) is an essential and versatile ingredient in Korean cooking. 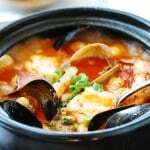 They can be grilled, stir-fried, deep-fried, used in soup or stew, and made into a salad. 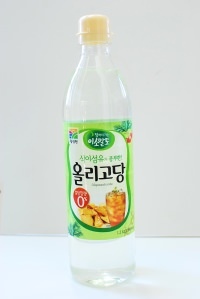 Dried squids in various forms are also very popular as snacks or ingredients. 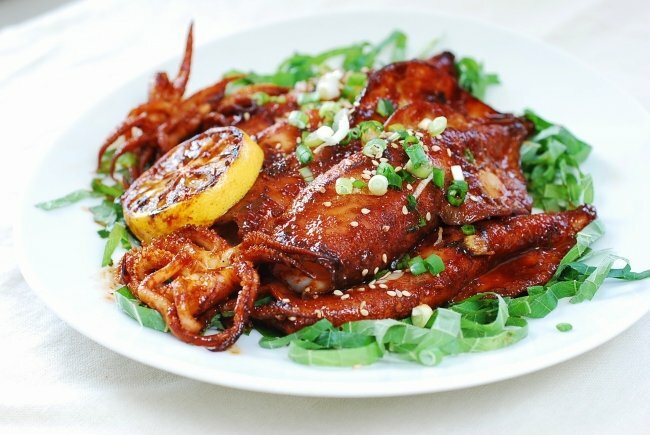 Grilled squid (o-jing-eo gu-i, 오징어 구이) is highly popular as street food or drinking snack food (anju, 안주), but it’s also popular as a main or side dish at home. 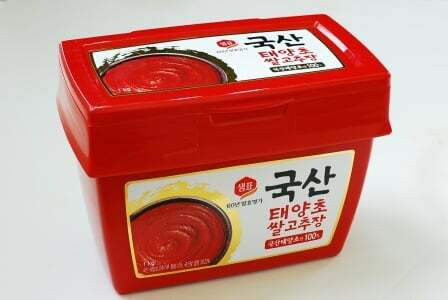 I used a small variety of squid called hanchi (한치) which can be found in Korean markets around here. Hanchi has thin flesh and short tentacles. 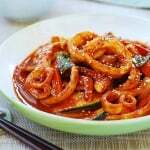 This variety of squid is slightly bigger than the small squids (calamari) commonly found in America, but equally tender. 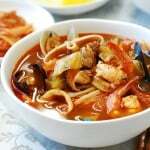 You can also use smaller or larger squids for this recipe. 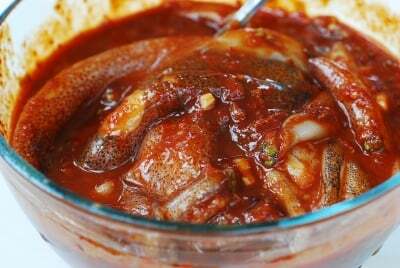 The squids are marinated in a spicy gochujang sauce similar to the sauce I used for grilling baby octopus. 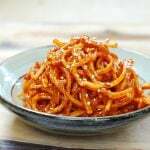 The classic sauce gives the squids intense flavors with heat! 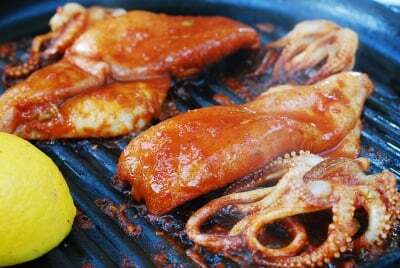 Typically, the whole squids are grilled over an open flame, but you can quickly sear it in a hot frying pan as well. 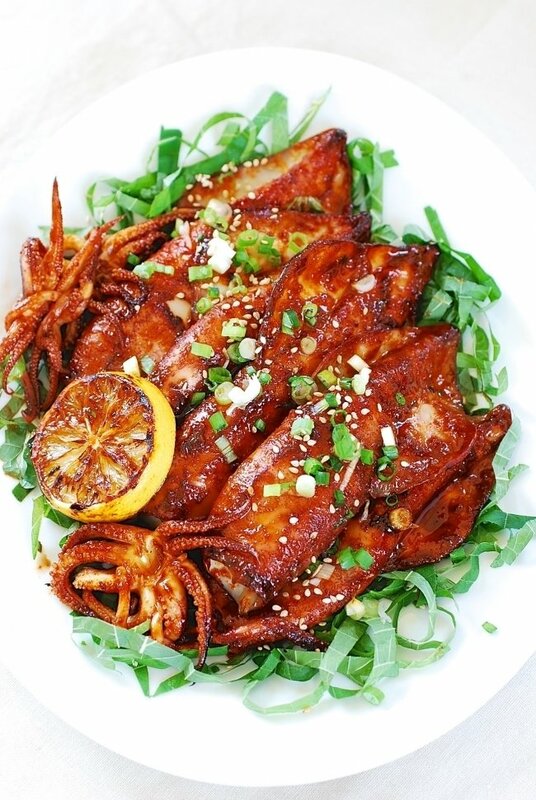 Serve the squids whole, or cut into bite size rings, with any salad like vegetables. 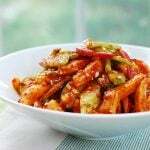 However, this spicy marinated squid pairs really well with perilla leaves (kkaennip, 깻잎). 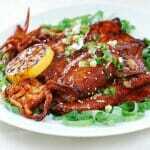 You can serve the squid on the bed of thinly sliced perilla leaves and/or serve perilla leaves separately as wraps. 6 to 8 perilla leaves kkaennip, 깻잎, thinly sliced (more for wraps) - or spring mix, arugula, lettuce, etc. 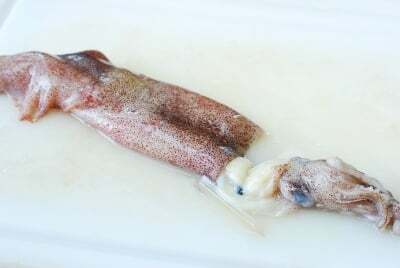 Clean the squid by carefully pulling the tentacles until the innards slip out of the body. Use your fingers to reach inside the tube and remove any remaining parts. Cut the tentacles from the head just below the eyes. Remove the beak from the center of the tentacles. Discard everything except the body and tentacles. Rinse the squids well under cold running water. Drain. 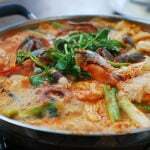 In a bowl big enough to hold the squids, combine the marinade ingredients, and stir well. Add the squids and coat evenly with the marinade, and then marinate in the fridge for about 30 minutes. Heat a lightly oiled grill or a frying pan until very hot. Add the squids, and sear quickly until the squids curl up and turn opaque, about a minute, depending on the size of your squid. Flip them, and cook for another minute. You can baste with the sauce if you like. Remove the squids. 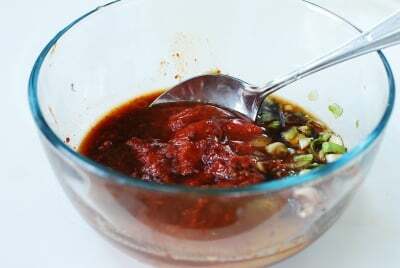 You can pour the remaining marinade to the pan, bring to a boil, and use as extra sauce. Plate them on the sliced perilla leaves or any other vegetable of your choice. Drizzle some lemon juice over, and garnish with a slice of lemon. Hi, a guy from Madrid here!